Single-use capsules are a simple and convenient way of making an espresso-based drink in the comfort of your kitchen or office. They have grown in popularity over the past few years and these coffee drinkers love affair with pods shows no sign of slowing down. The downside is that with so many capsule coffee makers to choose from, finding the right one to meet all your needs can be a challenge. 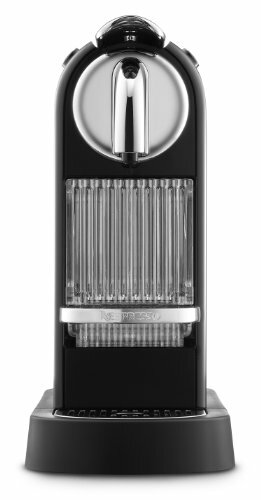 CitizModelled after an art deco skyscraper, the Citiz is one of Nespresso’s iconic designs. In addition to looking handsome sitting on your kitchen counter, the Citiz offers a range of useful features. These include the ability to store up to ten used capsules at a time and two cup trays that can accommodate taller mugs and glasses, as well as standard real espresso demitasse and coffee cups. The bottom tray is removable while the top tray is foldable. The unit is fully automatic, with a neat back-lit feature that is both functional and adds to the aesthetic appeal. The Citiz features a removable water tank that can hold up to 34oz of water. 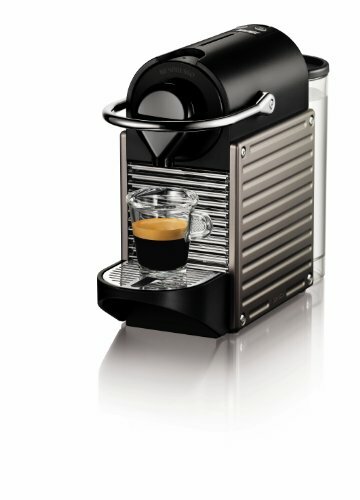 The factory presets allow you to dispense espresso and (larger) lungo-style coffee. The unit is also programmable to custom values. When you’re ready to brew, the Citiz takes around 25 seconds to warm up. Loading the coffee pods is easy. Simply lift the flap on the top of the unit and insert a fresh pod. Select espresso or lungo using the dedicated buttons. Once the coffee has dispensed, the pod is ejected into the drawer below for removal and disposal. Nespresso offers a recycling program for spent pods and you can separate the elements (foil top, aluminum container and used coffee grounds) for responsible disposal. For extra energy-saving benefit, there is a preset automatic shut-off time of nine minutes, but you can extend this up to 30 minutes if this is more convenient. The Citiz uses 19 bar pump pressure, which is pretty powerful and helps ensure optimal real espresso extraction. The espresso produced by the Citiz espresso machine has a nice layer of crema and the unit certainly gets the best out of the pods. 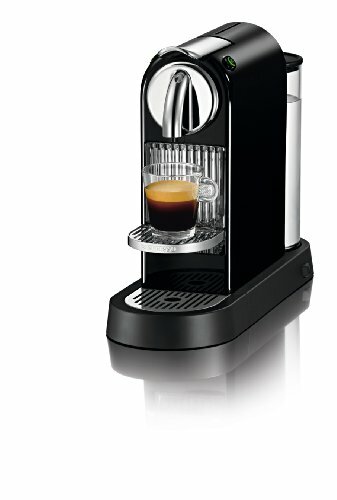 One of the benefits of the Citiz over the Pixie is that there is the option to purchase a model which has an in-built Aeroccino milk frother, which allows you to produce creamy lattes and cappuccinos, etc. The Aeroccino can also be bought separately. Maintenance requires carrying out a descaling process around twice a year. A kit can be purchased separately. The outside of the machine can be wiped with a soft cloth and the removable parts cleaned in warm, soapy water. Overall: If you’re looking to take your first steps into the world of the capsule coffee machines, or are searching for a coffee solution for your workplace, the Citiz is a good all-around choice. 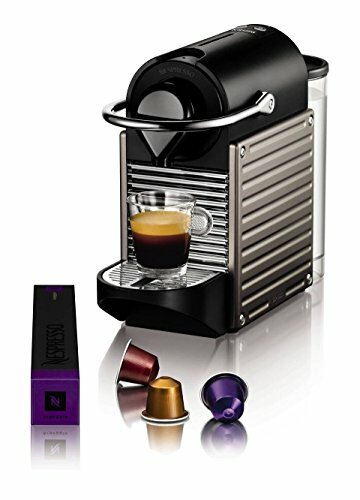 It offers all the benefits of pod coffee combined with Nespresso’s stylish design. For more details on the Citiz, you can check out our standalone full review here. Small but perfectly formed, the Pixie is shorter in height than the Citiz and comes in a wider range of colors. With its textured aluminum sides, this is a more modern, industrial design than the Citiz which may look nicer in minimalist-style kitchens. As you can see from the specifications detailed above, this model shares much in common with its counterpart. Similarities include the snazzy back-lit feature, quick heat-up time, and ability to store up to ten used capsules at once. You will also notice it uses the same 19 bar pump pressure, which ensures the Pixie is capable of optimally extracting the coffee during the brewing process. This means both machines offer the same coffee quality. There are preset and programmable espresso and lungo options, just as with the Citiz. Again, maintenance requires carrying out a descaling process around twice a year, while the outside of the machine can be wiped with a soft cloth and the removable parts cleaned in warm soapy water. So what are the differences? One thing you’ll notice is that the water tank capacity is a full 10oz less than the Citiz. For light home users, this may not be such an issue, but for heavy use, such as large households or workplaces, this may be an important factor in choosing between these two machines. However, to complicate matters, the Pixie does feature a handy ‘empty water’ indicator that lets you know when you need to refill the reservoir, something not found on the Citiz model. In addition, while the Pixie features the same nine-minute auto shut-off feature, this is fixed and cannot be programmed for longer. The basic operation of the Pixie is the same as the Citiz. However, the procedure for loading capsules is slightly different. With the Pixie, you lift the lever, which pushes out the brew head. You can then place a pod in the slot and push the lever back down to retract the brew head. Selecting the espresso or lungo options is done via the dedicated buttons, just as with the Citiz. Again, once the coffee has dispensed, the pod is ejected into the drawer below for removal and disposal. The Pixie has a single foldable cup/drip tray that can accommodate taller mugs and glasses. However, this feature is a little less flexible than the Citiz. To remove the drip tray, you also need to remove the spent pod drawer. Additionally, the Pixie model does not offer the option of an integrated frother. If you want to be able to steam milk, you can buy the Aeroccino separately. Overall: With its more ‘industrial’ design, the Pixie might not be as aesthetically iconic as the Citiz, but make no mistake; this is a Nespresso capsule machine of equal quality and much the same functionality, with a few slight variants. For more details, you can check out our full stand alone review of the Pixie here. Both machines are well-made and offer all the benefits of Nespresso pods. Bought new, they come with welcome packs of 16 Nespresso capsules to get you started. The price point on both is similar, depending on the color and bundle options you select, as well as any deals available at the time of purchase. In general, the Pixie tends to be slightly cheaper. As to the coffee quality, that really is a no-brainer with both the Citiz and Pixie. After all, the whole point of the pods is that they offer a foolproof way to make espresso-style coffee. In short, if you like pod-based coffee, you really can’t go wrong with either of these machines as they essentially work in the same way. The difference between the Citiz and Pixie lies mainly in the design and features on offer. The Citiz has a water reservoir which is 10oz larger than the Pixie, which may make it more attractive to some users, such as office workers looking for a convenient workplace coffee solution. In addition, you can opt for the Citiz model with the built-in milk frother. Aesthetically-speaking, the Citiz‘s tall, slender ‘Chicago art deco’ design is arguably more appealing. The slightly shorter, modern Pixie is a more compact unit and comes in a varied range of colors to match with your other appliances. So, which is the best? Well, that’s really up your personal taste and needs. But while we can’t make the final decision for you, hopefully, this guide has helped you in your search for the perfect pod machine!